Bluetooth is a wireless personal area network (WPAN) communication system standard that allows for wireless data connections to be dynamically added and removed between nearby devices. Each Bluetooth wireless network can contain up to 8 active devices and is called a Piconet. Piconets can be linked to form Scatternets. Information about Bluetooth technology and wireless data can be found at www.Bluetooth.com. The system control for Bluetooth requires one device to operate as the coordinating device (a master) and all the other devices are slaves. This is very similar to the structure of a universal serial bus (USB) system that is commonly used in personal computers and devices such as digital cameras. However, unlike USB connections, most Bluetooth devices can operate as either a master (coordinator) or slave and Bluetooth devices can reverse their roles if necessary. 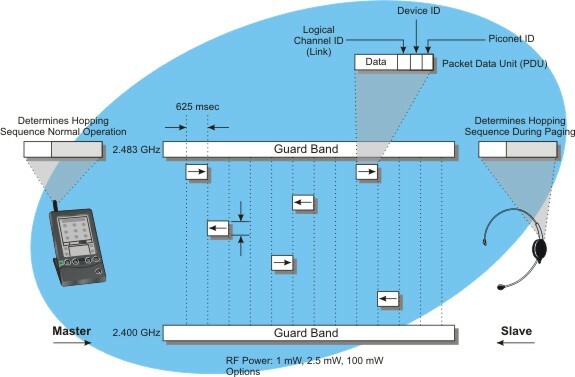 Wireless access protocol (WAP) is an industry specification that allows advanced messaging and information services to be delivered to wireless devices independent of which wireless technology they use. 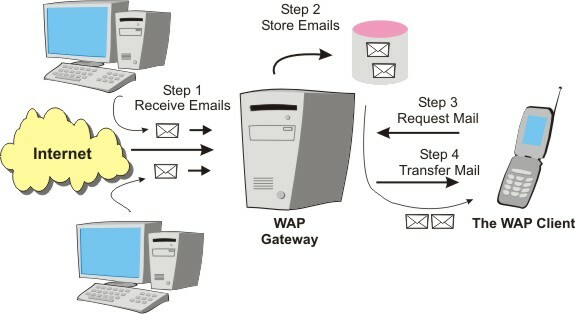 A WAP server is a computer that can receive, process, and respond to an end user's (client's) request for information or information processing. This figure shows how pull notification works with a WAP server. This example shows a WAP push proxy gateway that receives email messages that are addressed to the WAP client. The push proxy gateway stores these messages until it receives a request from the WAP client for the delivery of messages. The WAP client will then download (pull) the messages from the push proxy gateway so the messages can be displayed on the users phone.